Yes, I went to a Trump Rally. The original crowd of protesters gathered outside of the Connecticut Convention Center, at about 6:45 P.M., some of whom had already been there for nearly four hours. It was a fairly normal Wednesday when I first learned what was going to happen in Hartford that coming Friday night. I was skimming through the news app on my iPhone and among the local news articles I saw was "BREAKING: Donald Trump coming to Connecticut." After all the unrest he had been causing, and the publicity he had gotten as a result, I was interested to see why he was coming to my state. After reading the article and learning about all the preparation the Hartford Police Department and other units had underway for his arrival, and the protestors his rally would inevitably attract, I was eager to see where I would be able to fit into it all. There had not been any other rallies in the area recently that I had been able to attend, and that Friday seemed like a perfect time to attend one of the most infamous of them all. Having followed many photographers who had been getting amazing shots of the dissension that gained the world's attention in Ferguson, Missouri, I was eager to see if there would be anything comparable happening that I could photograph. Sure enough, after searching around online, I found a Facebook event being held by the Answer Coalition called "All out to Protest Trump in Hartford!" I checked the box to signify I was "Interested" and before I knew it, I had sorted out the logistics and I was clicking the "Checking in" box because I had arrived at the protest in Hartford. As we approached the crowds of protesters already gathered, they chanted clever slogans and let their opinions be heard. Some held signs that were given out by organizations, while others held vivid homemade signs with detailed illustrations. Cameramen from various news companies bounced around getting footage of protesters and the confrontations that occurred between people on the opposing sides. Police officers valiantly stood at their outposts ready to step in if they had to, wielding dozens of disposable plastic handcuffs should they need to restrain anyone. Through the convention center's large glass windows you could see more officers hurrying around inside, getting to wherever they needed to be. Officers from the K9 Unit walked around the building, with their well-trained companions sniffing around for danger. The occasional figure could be seen pacing on the rooftops, most likely a Secret Service agent keeping an eye out for any potential threats below. As the protestors began to lose some of their enthusiasm, they regained it in an instant as Trump supporters began to flow out of the convention center, signaling the end of Trump's rally. For the protestors and others who had been waiting outside, the night was really just beginning. 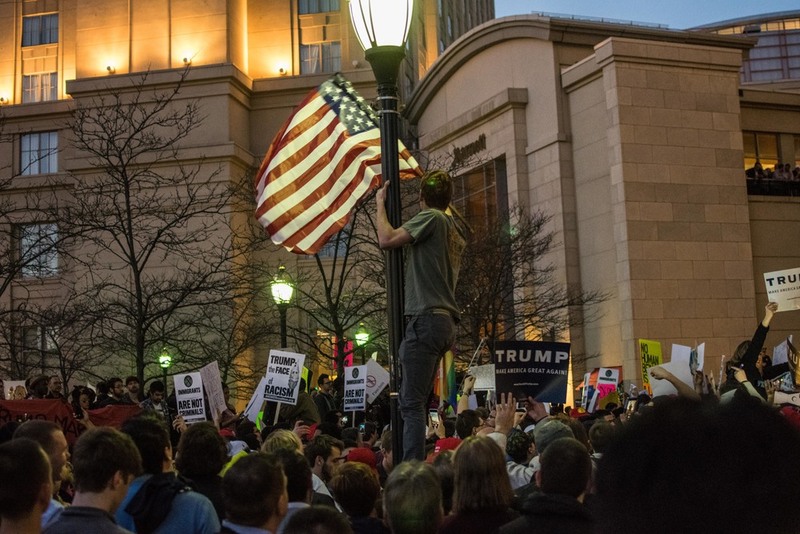 A Trump supporter emerges from the sea of people, hanging from a lamppost and wielding an American flag. A Trump supporter (in the blue hat) confronts a group of protestors. Protesters stand together in unity protesting Trump's proposed immigration reforms and the racism he represents to them. Officers from the Hartford Police Department act in a skirmish line, moving protestors off the sidewalk. A police officer guides a large crowd across a busy street.